Who doesn't dream of spending their days on the water, enjoying the sun and surf and cruising America's coastal regions? The only way it gets better than that is if you could get paid to do it. For people interested in careers in criminal justice and criminology, working as a marine patrol officer allows you to do just that. Marine patrol officers serve to ensure the safety of boaters and others who enjoy both fresh and saltwater activities such as water skiing, jet skiing, rafting, swimming, and fishing. They also help encourage and enforce conservation efforts through the enforcement of laws related to fishing and boater safety and licensure. Officers may work for a separate state agency, a division of the state police, or a special unit within a local sheriff's office or police department. Regardless of who they work for, if it happens on the water, the marine patrol is generally responsible for it. Marine patrol officers investigate boating accidents and fatalities, as well as other water-borne tragedies including drownings. They may also be asked to assist in locating missing persons who were last seen near water bodies or who fell overboard from boats. Marine patrol officers are also called upon to remove dangerous reptiles and marine life, such as alligators, crocodiles, snakes, and even sharks. Marine patrol officers spend most of their time on the water or near docks and recreation areas. They work in all sorts of weather and thus may at times be required to endure harsh and undesirable conditions. Officers may be called upon to perform a variety of tasks and provide general law enforcement services to major bodies of water. Many officers are federally deputized, giving them expansive police powers and jurisdiction beyond state-controlled waters. 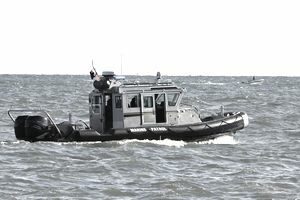 Some jurisdictions have consolidated marine patrol functions with other conservation agencies so those marine patrol officers may also serve as wildlife officers. Marine patrol officers rigorously enforce laws related to underage drinking and boating under the influence. They ensure boaters have the required safety equipment, such as life jackets and flares, and they are on hand to provide rescues to people in distress. They may even provide a tow if necessary. Marine patrol officers are law enforcement officers with full police powers. As such, they must attend a police academy. Sometimes, they may also be federally deputized, and they will also receive specialized training dealing with safety, conservation and laws and situations unique to aquatic environments. Individual departments may vary on specific requirements, but in general, officers must have at least a high school diploma or GED. Job candidates should also have either some college, some prior law enforcement experience or prior military service. Often, preference is given to those candidates who hold at least an associate's degree. Additionally, many agencies use veteran's preference points, meaning military veterans receive priority in hiring. Officers need to have strong interpersonal communications skills because they interact with a variety of individuals in a variety of situations and environments. They may as easily be found dealing with a family of four on a family outing as a poacher or intoxicated boater. Marine patrol officers must also be in an excellent physical condition in order to be prepared for the rigors of the job, and they must be strong swimmers. Naturally, they will need to know how to drive a boat, and they should also be able to handle a vehicle-trailer combination and back a boat trailer. A thorough background investigation, possibly including a polygraph exam, will likely be required. According to the Federal Bureau of Labor Statistics' Occupational Outlook Handbook, growth in law enforcement jobs, in general, is expected to be below average through 2020. However, through natural attrition and turnover, candidates hoping to become marine patrol officers will continue to be able to find ample employment opportunities. The best places to look for marine patrol jobs are coastal states like Florida and communities with large bodies of water, such as those near the Great Lakes. Marine patrol officers can expect to earn between $32,000 and $88,000 per year, depending on agency and location. Typical starting salaries will more likely be between $32,00 and $46,000. Is a Career As a Marine Patrol Officer Right for You? Marine patrol officers often work in beautiful environments and spend a great deal of time on the water. If you're uncomfortable near the water or you're not a strong swimmer, then a job as a marine patrol officer probably isn't going to be what you're looking for. If, however, you enjoy being outdoors, boating, working with people and learning about marine life, then you may very much appreciate a fun and rewarding career as a Marine patrol officer. You might find it to be the perfect criminology career for you.